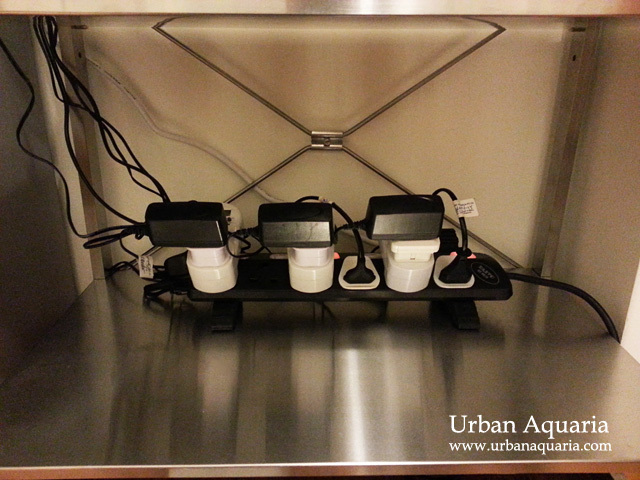 Lately i have been looking to keep more fish tanks, yet still fit them within the limited space allocated in my room... so the most efficient solution was to setup a rack system. While i could have custom made a rack system to my specifications, the rack makers i spoke to either took too long to custom make them, quoted really high prices, or simply refused to make the rack to my particular dimensions and color specification (i wanted a powder coated light grey or at least a bare steel look). Since the shelving is completely made of stainless steel, it is naturally water resistant (perfect for aquariums) and the frame is bolted to the top and bottom shelf (along with a steel cross-brace), so the entire structure is quite sturdy. The middle shelves are adjustable and held with steel pins. They come in 3 configurations: 178cm height x 36cm wide, 89cm height x 36cm wide and 89cm height x 60cm wide (all have 35cm depth). 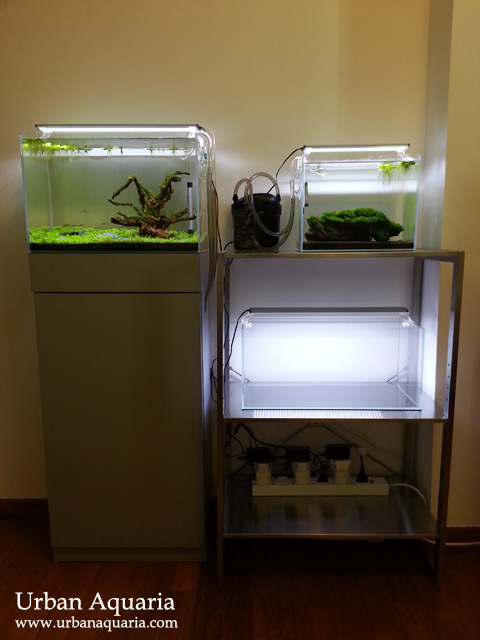 I choose the 89cm height x 60cm wide version, as i plan to have tanks which are at least 45cm wide. 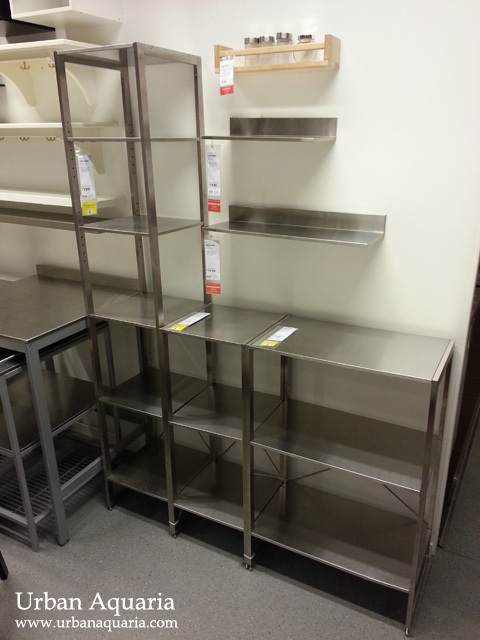 For that shelving configuration, its information label mentions that the middle shelf can take up to 25kg load. Although its probably a conservative load measurement, i will still try to keep to that weight load recommendation for the middle shelf. I noticed straight away that there will be an issue with the tank placed on the middle shelf, even at the lowest height setting, if i were to use a standard 45cm wide x 30cm tall tank, there will be very little space for me to work on the tank during setup and maintenance, so i need to get a tank that is wide yet short. After shopping around, i found that the GEX Glassterior 450 could fit the dimensions i want, but it is made of normal glass... and i was looking for low-iron high clarity glass tanks. Okay, let me elaborate why i'm abit more particular about getting low-iron high clarity glass tanks. In addition, normal glass tanks tend to look noticeably out of place amongst a setup with multiple low-iron glass tanks, so i have to make sure all my tanks have consistent glass clarity. Unfortunately, low-iron glass tanks are not as common as normal glass tanks, and the current ones i see in local aquarium shops don't come in the wide but short design that i was looking for. I was recommended to custom make it (costs alot more and have to wait), instead i decided to continue my search for suitable ones. Its dimensions are 48cm width, 22cm depth and 23.5cm height... and its made of low-iron high clarity glass. 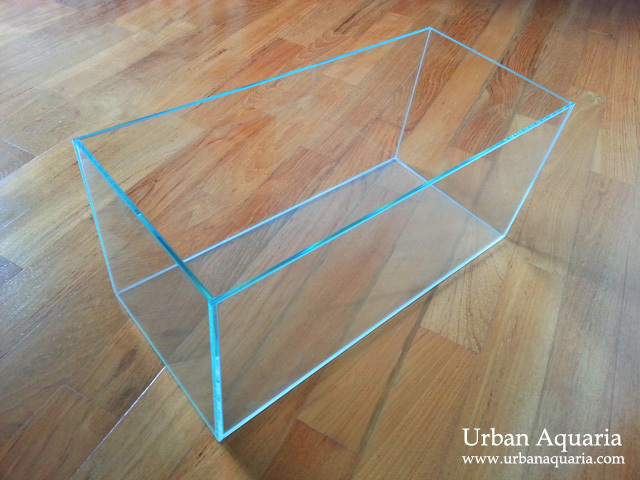 This is the exact wide but short glass tank that i was looking for! The only issue was that it has an internal overflow sump (IOS) compartment built into the tank. While this is good for those who are planning to use an IOS filter system... i plan to use a canister filter with glass lily pipes, so the IOS compartment will not be used. Luckily the IOS compartment is attached to the tank with silicon, so it can be removed. 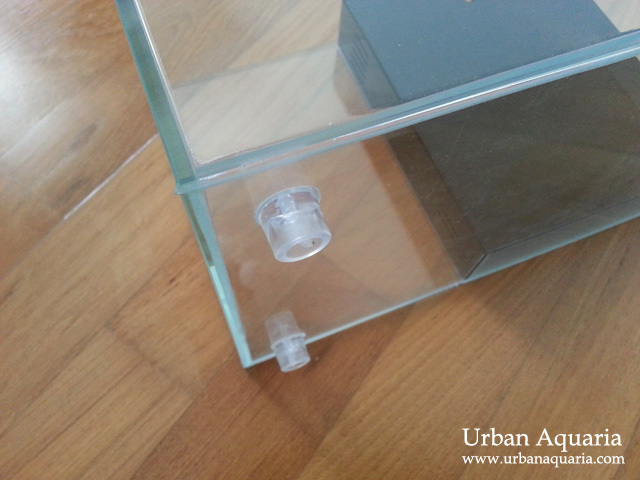 In addition, the tank comes with plastic feet attached to the bottom with silicone. I prefer a flat bottom tank placed on a foam base sheet, so those plastic feet will also have to be removed (it'll help further reduce the tank height too). After a few hours of tedious trimming and careful scraping of the silicone, both the IOS compartment and plastic feet are removed... a good rinse and dry, and the tank is ready! After modification, the tank dimensions is now 48cm width x 22cm depth x 22cm height, which works out to around 23 litres in volume. 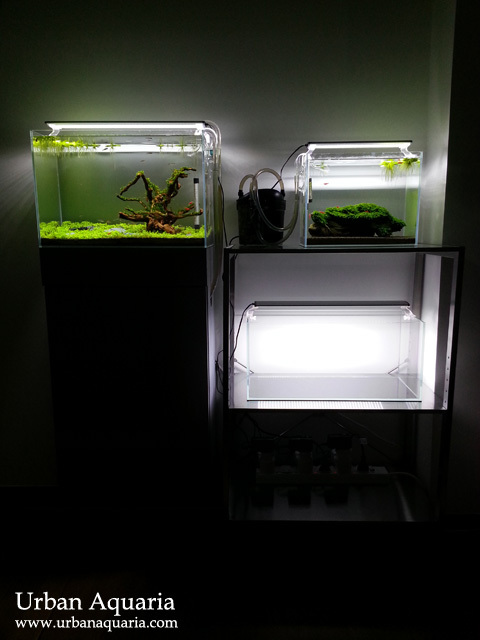 My existing 32 litre/45cm "Tree Scape" tank is currently placed on a custom made cabinet positioned beside it. There is a tall enough gap between the tank on the middle shelf and the top shelf, so its easy to access it during tank maintenance. In this configuration, the bottom shelf still has around 30cm in height space, which is enough to fit short canister filters like the Eden 501 or the Eheim Ecco Pro 130 (i'll be using that filter for the larger tank on top). Yes, i could have put up to 60cm wide tanks on this rack too, but i choose to stick to 45-48cm wide ones as i prefer to have some extra working space on the sides, and the tank in the middle shelf will not be blocked by the steel frame too. 6th March 2013 - Update! Fellow AquaticQuotient forumer Merviso highlighted that with the steel structure and tanks of water on the shelving, my power extension strip at the bottom shelf could become a hazard if water happens to drip down to that area, so his suggestion was to raise the power extension strip higher on top of some insulation material to minimize danger in case of any water leakage or spillage incident. As shown in the photo above, the power extension strip simply sits on the rubber door stoppers positioned at both ends so that it is insulated from the steel shelving. In addition, it is also placed at an angle on the rubber door stoppers (like on a ramp), so the switches are also now much easier to view and access too. I have also ensured that all the wiring are positioned in a "drip loop" configuration and all the power plug holes are fully covered, so hopefully this will further help reduce the chances of any potential electrical issues in this setup. Hi, how long have you been using the Limhamn rack? Is it still withholding the tank's weight well? I've been using it for more than a month now, so far the rack is still holding the tanks well. Great design and setup! Do you notice any warping on the middle rack at all? I looked at this item in Ikea and just worried it won't last. I really like this clean design and have started looking at 2nd hand kitchen suppliers for small stainless steel worktops. With the 20 liter tank, i've not spotted any warping in the middle shelf so far, probably because the total weight is still within the recommended load limit. I wouldn't put heavier tanks on the middle shelf though. For heavier tanks, such shelves would need to be held up and reinforced with sturdier support bars. Hi, wonder how u managed to remove the ios compartment. Had this same tank as yours but cant find any way to get rid of it. Care to share the equipment you used to remove it? Thanks. stainless steel are break up free as well as they are rust proof and light in the weight. can be easily place to any place without any difficulties. Steel are made up of iron and different type of other alloys. Hey how much did that LI/HC tank cost? The tank actually comes as a complete package with a clip-on LED light and submersible pump, all in for around SGD$108... but since i already plan to use my own light set and canister filter, the store rep was nice enough to just sell me the tank on its own for SGD$68. I can't remember exactly (its been a while) but i think it cost around S$99 for the version i got, not sure if this series is still available at IKEA stores anymore though. Hi, where did you get the cabinet custom made? 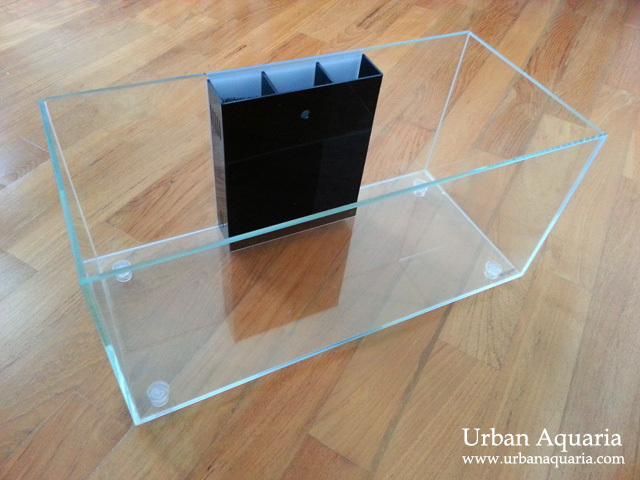 The cabinet was custom made by CR Aquarium. Hey, I know this was a long time ago, but I am in need of shelving/racks as an efficient solution for keeping multiple aquariums. I've seen a lot of posts around the internet about different types of metal shelving being a problem because they wind up bowing and/or supporting the tank unevenly, resulting in tanks literally bursting in the worst cases (the glass flexes a little bit because the tank is not evenly supported by the shelf and soon the fish are on the floor) and cracking and leaking everywhere in the best cases. Are those shelves from Ikea still holding up for you? The aquaria I need to support will all be in the range of 10 gallons (~40 L) to about 30 gallons (~120 L). If yours are bowing, I'm definitely going to need something else. I've since shifted those tanks to another dedicated higher load bearing metal rack... but from my experience using the IKEA metal shelving for a few months, it was able to hold the weight of the 48cm tank (which worked out to around 25-26kg in total when filled with water). I didn't notice any bending or bowing of the metal shelves during the period of usage, but thats probably because the overall tank weight was still close to the maximum recommended load of the shelves. I'd probably not risk putting more weight on those shelves though, a 10 gallon tank (probably around 40+kg) or 30 gallon tank (approx 120+ kg) would most likely bend the shelves or break its mounts quite easily. For heavier tanks, it'll definitely be much safer to use dedicated metal racks which are designed to support heavier loads.